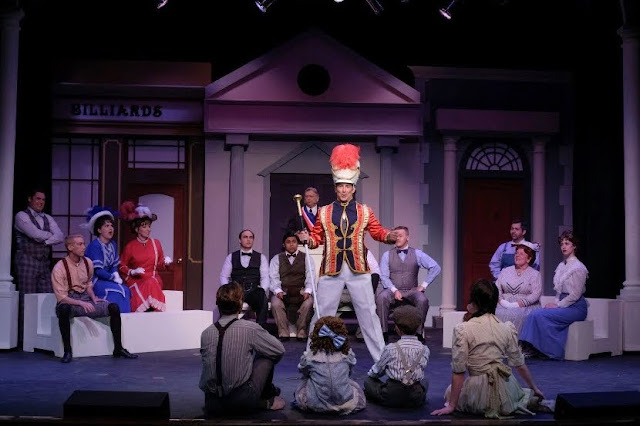 Carol's Theatre Reviews ~ It's Fun To Go Out: “The Music Man” still resonates with an upbeat cast at Welk Resort Theatre. 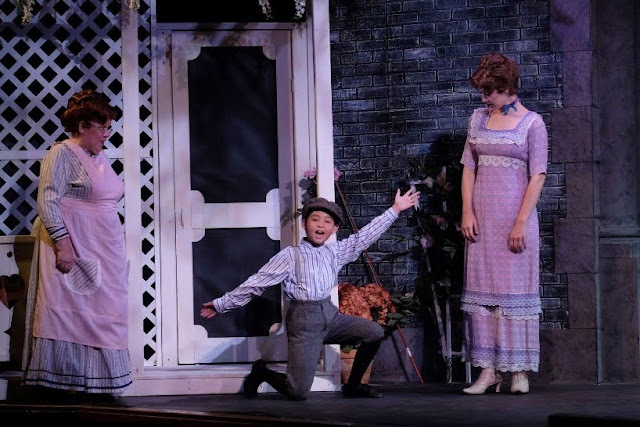 “The Music Man” still resonates with an upbeat cast at Welk Resort Theatre. Meredith Willson’s 1957 Tony award winning musical starring Robert Preston is based on a story by Willson, who comes from Mason City, Iowa, and Franklin Lacey. At its center is ‘Professor’ Harold Hill (David S. Humphrey), a smooth talking, fast-talking con man who comes into the small town of River City, Iowa posing as a boys band organizer. Con man ‘Professor’ Harold Hill along with other traveling salesmen are making their way through ‘the territories’ to peddle their wares on the Rock Island R.R. Hill makes a quick exit off the Rock Island RR (“Rock Island”) when he learns that he is a wanted scammer from the others on the train. With all his blustering ‘Professor Hill’ is shrewd enough to recognize that the men on the school board are ripe to be organized into a Barbershop Quartet (“Goodnight Ladies”, “Lida Rose”/Will I Ever Tell You?”) and quick enough to evade all references to his non references. Willson’s music and his uncanny insight into small town mentality and tradition while poking fun at the hypocrisy of it all, is a hoot to watch. It translates into one of the most upscale and popular musical comedies of the times and reinforces the notion that if you give audiences a clever, funny and somewhat probable story, with an abundance of music they can hum on the way out of the theatre, coupled with youthful energy and family friendly language, topped off with a happy ending, they will follow you anywhere. The show won five Tony Awards including Best Musical. It played over 1300 performances on Broadway, was made into a film adaptation in 1962 and has gone through several revivals. 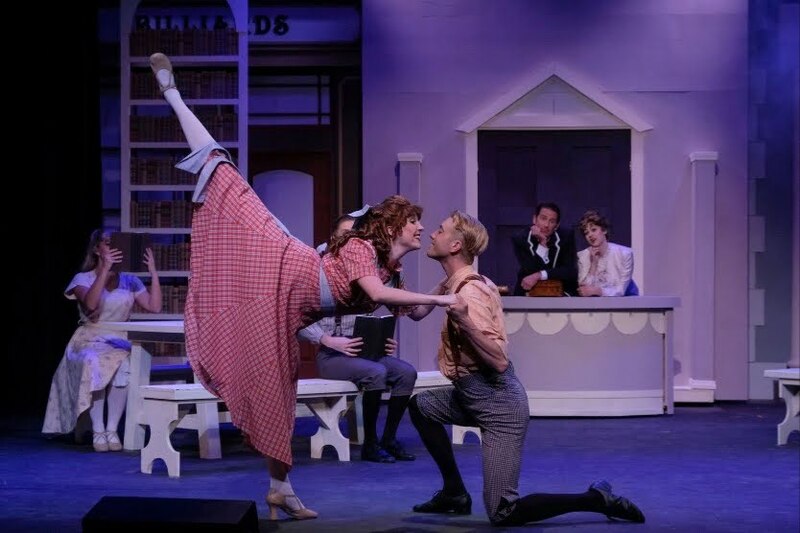 It is currently on stage at The Welk Resort Theatre in Escondido through July 30th and it’s probably one you might not want to miss. Ray Limon directed and choreographed (his dancing prowess has his handwriting all over it) this revival with panache and confidence. This in spite of the music being too loud and, unlike other productions at Lawrence Welk that featured live instruments from the pit, there is no music ‘from the pit’. Musical director Justin Gray pre recorded the sound track giving the actors more of a challenge to keep up with the recorded ‘orchestra’ than counting on a live orchestra/conductor to follow cues. That aside, Limon and his minions pay due respect to the overall look and upbeat feel of the show where tensions between some of the characters might rise above a one on the Richter Scale. But with numbers like “Seventy Six Trombones”, “Pickalittle”, “Wells Fargo Wagon”, “Shipoopi” and “Trouble” they flatten out when the love story between Hill and “Marian the Librarian” begins to jell. Humphry’s Hill is as handsome as he is talented and persuasive weaving and skirting through the maze of endless detours he faces as Shinn tries to track down his credentials and Marion plays hard to get while falling head over heels for him. Wilkinson’s Marion is a fine match for Humphry’s Hill. Both are in full voiced harmony. “Till There Was You” and “My White Knight”. She too would like to know Hill’s past after hearing rumors, but realizes…what’s the use. Between her mother’s (Jenny Wentworth) coaxing and brother Winthrop’s enchantment with Hill, she just drops the issue and let’s the chips fall where they may. The good folks of River City will never be the same after Hill spent some time there. Marian’s brother Winthrop (Bobby Chiu) will not be afraid to speak because of his lisp, his shyness and sadness will be overcome and he will come into his own (“Gary Indiana”). Check him out, he’s adorable. Mayor Shinn will continue to be irritated by everything and baffled by himself. His wife Eulalie Mackecknie Shinn would learn to stand up to her husband, (Robin LaValley is a hoot as a community organizer (“Columbia Gem Of the Ocean”) and ‘the spinster’ Marian , we can conclude lives happily ever after. The Mayor’s daughter Zaneeta Shinn (Kylie Molnar) will be able to walk hand in hand (in public) with her ruffian beau; Tommy (Sean Kiralla) and Tommy would take on a leadership role pushed by Hill, and give it up as the town’s troublemaker. Both Molnar and Kiralla are finds. Their dance numbers including some very high kicks are awesome, especially Kiralla. 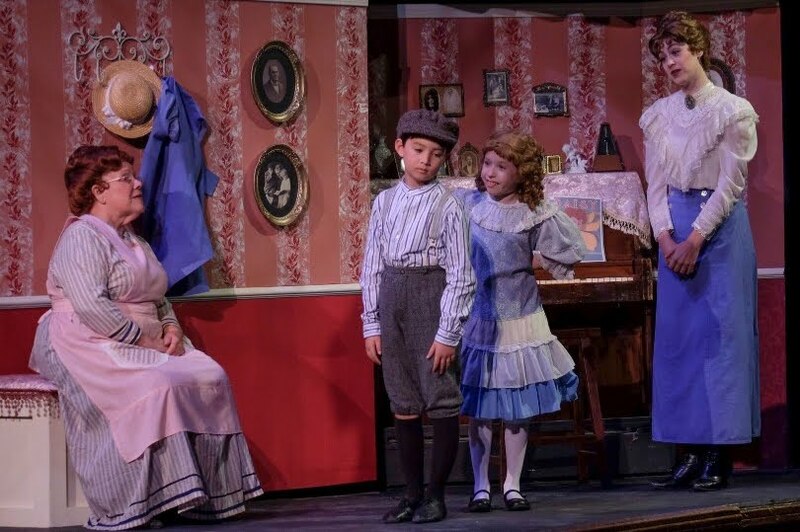 On the technical side, lighting design by Jennifer Edwards, sound design by Patrick Hoyny, the serviceable set by Mike Buckley and costumes provided by Jenny Wentworth and Fullerton CLO give the production all that it needs to fill in the blanks. The kid in me would have loved a grand finale marching band blaring out “76 Trombones”, but it wasn’t to be. That shouldn’t keep you from taking another trip on the Rock Island Line and hopping off in River City, Iowa.